11 Truly I tell you, among those born of women there has not risen anyone greater than John the Baptist; yet whoever is least in the kingdom of heaven is greater than he. A Vicar was fed up, waiting for the plumber to come. Eventually he sent him a note that simply said Matthew 11:3. When the plumber looked it up he found the verse “Are you the one who is to come or look we for another”? So the plumber sent a note back, simply saying Isaiah 50:2a “why did no one answer when I called”? Sorry – couldn’t resist the dreadful joke. 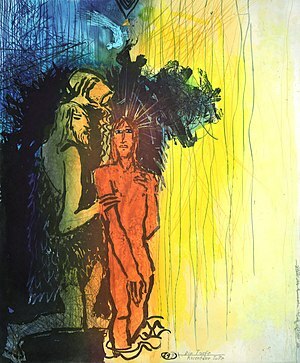 John the Baptist was undoubtedly a great man of God – one of the greatest prophets that the Jews had seen. In fact the New Testaments work hard to say that although John the Baptist was great, Jesus was greater, because there were many groups who followed John the Baptist as their leader even after the death and resurrection of Jesus. John the Baptist had huge numbers of disciples, his teaching was transformative, he challenged materialism, challenged injustice, challenged the dreadful leaders of his time and was well respected by everyone for it. He ended up in jail, of course. And jail is not an easy place to be. Not that I have personal experience of it, but in my rebellious teens I dated someone who had been in and out of jail, as had his friends. They spoke of it with horror. To do six weeks was unbearable, to do a long stretch such as a year was unthinkable. In jail they lost their freedom, their choices, their family, their girlfriends, their sense of self, their self-esteem, their ability to distance themselves from those who hurt them. They became completely disorientated and fearful. So this passage does not show John the Baptist in his best light – Jesus is different than what he expected – are you the one or are we to look for another? Perhaps it is the difference between his rather sober, austere outlook and rather angry God, who condemns things like adultery, compared with Jesus and his disciples having fun at parties and Jesus whose God forgives things like adultery. Jesus wasn’t doing religion in the same way as John. And this is of course a huge challenge in the church today – people failing to understand others and the way they worship God – the various factions all too quickly throwing stones. But the other thing to learn from this is how difficult it is not to lose our way when we are in situations that feel like prison. Of course they may not be actual prisons, we can get imprisoned in thought patterns, imprisoned in negative relationships, imprisoned by pain. Being alone can impact on this too – have you heard the story of the man who went to his priest and asked why he was feeling so cold, so far from God. The priest simply got the fire tongs and took one of the coals out of the fire and put it on the hearth. The coal went from burning white hot to red hot to black. The priest then put it back in the fire. And within minutes it was on fire again. We need each other. The spiritual journey is not undertaken alone. Jesus is very gentle with John – pointing out the evidence and then commending him. He does say that John is lacking something though, those who are least in the Kingdom of God are greater than John – perhaps he is the sense of the Holy Spirit at that time. If you compare John’s experience in prison with Peter’s experience when he was imprisoned then perhaps it is different – they sing hymns and an earthquake releases them, or Paul’s experience of ministering to his jailers. I don’t know. Whoever I am, Thou knowest, O God, I am Thine!